One of starting points in website speed optimization is the Gzip compression. It is used for compressing resources to reduce their transfer size. 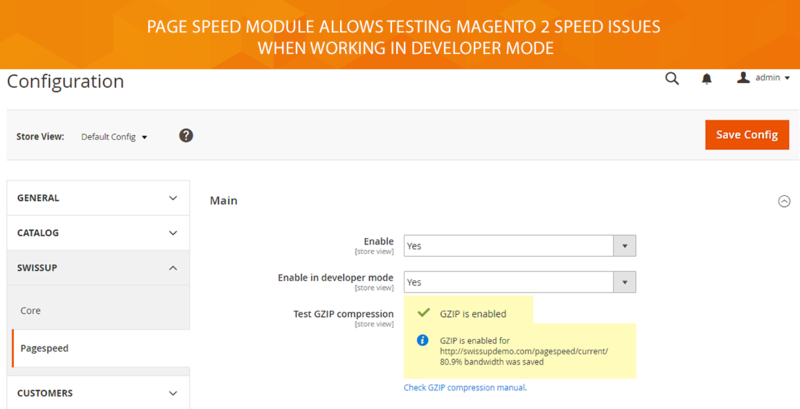 Our module supports Test gzip compression. If the results show your store still need the gzip compression, you have to enable that on your web server. 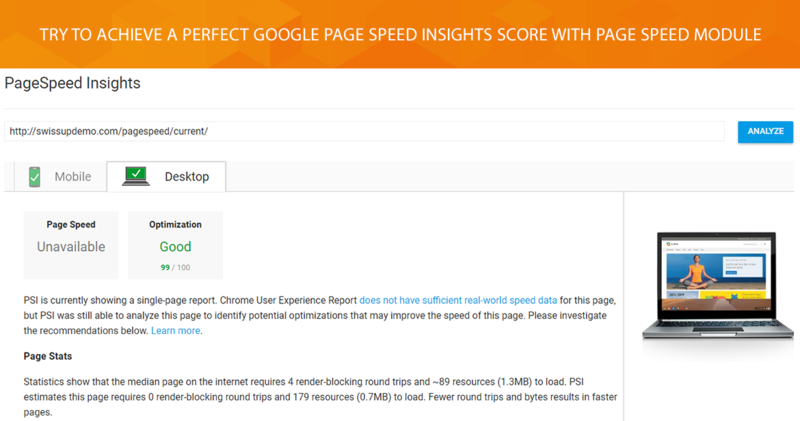 Page Speed provides the examples of enabling compression both for Apache and Nginx. CSS minification leads to a very lightweight version of your CSS, and as a consequence to faster page load speed. 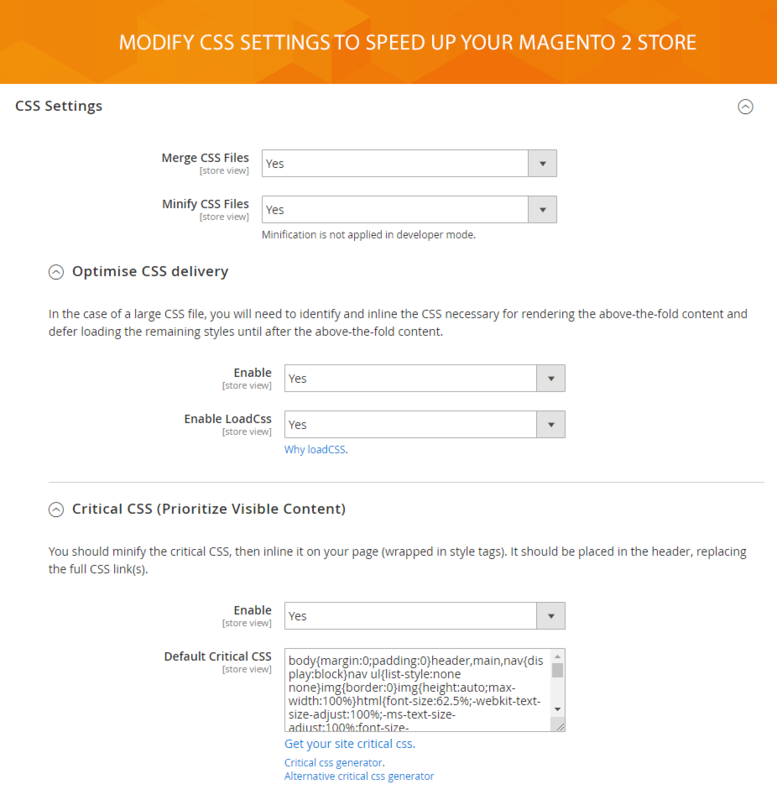 By compacting CSS code you will speed up download time and improve the website performance. 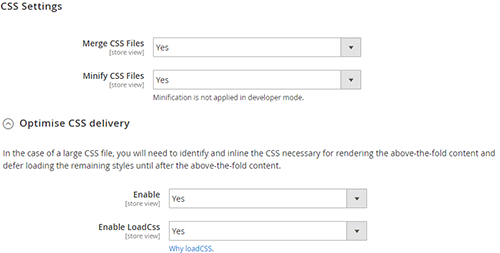 With Page Speed settings you could merge CSS files, minify CSS files, and optimize CSS delivery by enabling LoadCss js library. Prioritizing visible content is about reducing the size of the above-the-fold content. Only about 7% of the final above-the-fold content could be rendered with the full HTML response. So you have to structure your HTML to load the critical first. 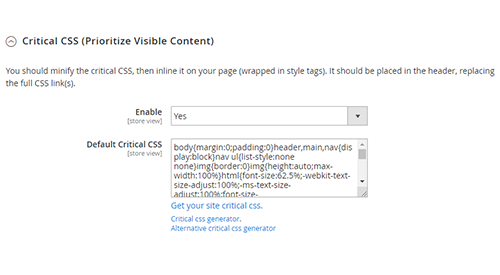 With Page Speed configuration settings you could set generated critical CSS to render above-the-fold content by including it directly in the HTML response. 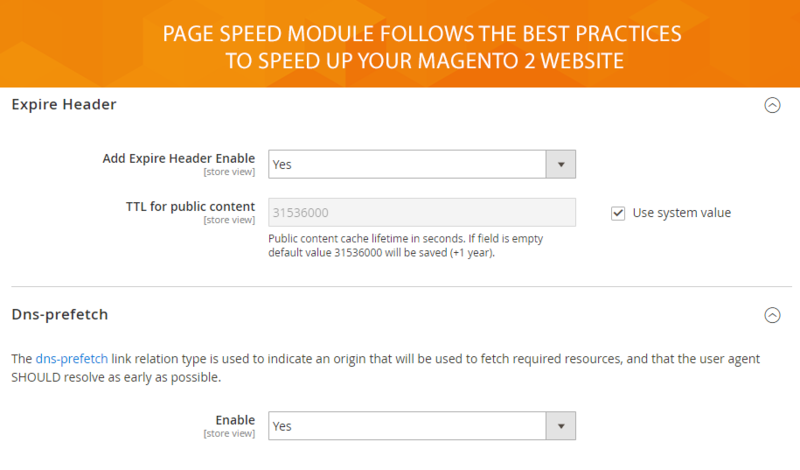 Page Speed module makes your Magento 2 store equipped with various performance image optimization features. That helps you to avoid overloading the page with heavy images. 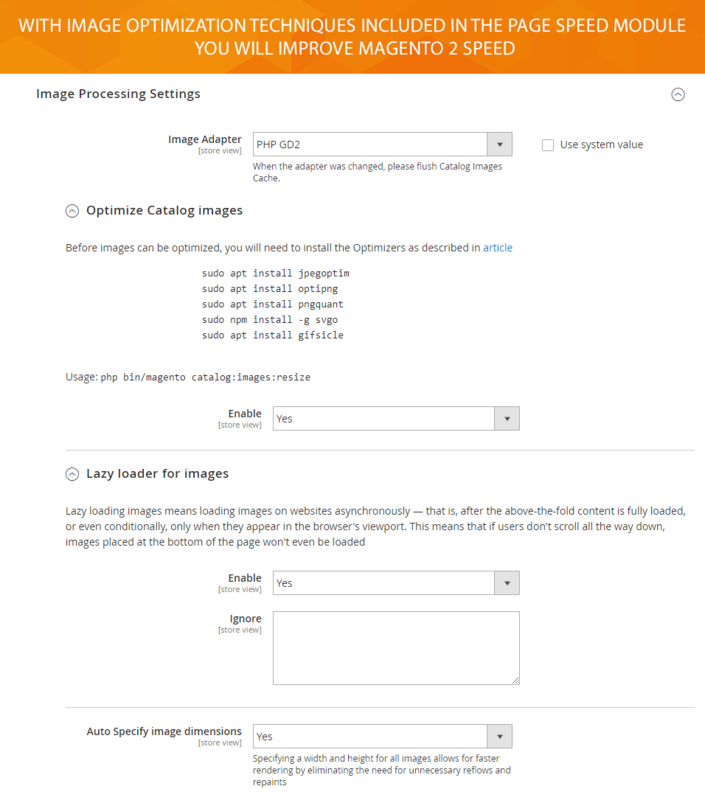 Page Speed extension comes with image processing settings that allow using an image adapter. 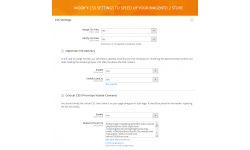 You could also enable catalog images optimization and use the way of lazy loading of images, including "Auto specify image dimensions" option. Nowadays the websites might have 50+ files per page to transfer. To prevent a huge server load increase, you have to create a request to every file. The constant downloading the same file leads to the wasting of precious load time. 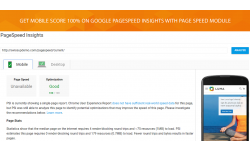 Page Speed module allows adding Expires Headers that helps to reduce the number of HTTP requests for the server. 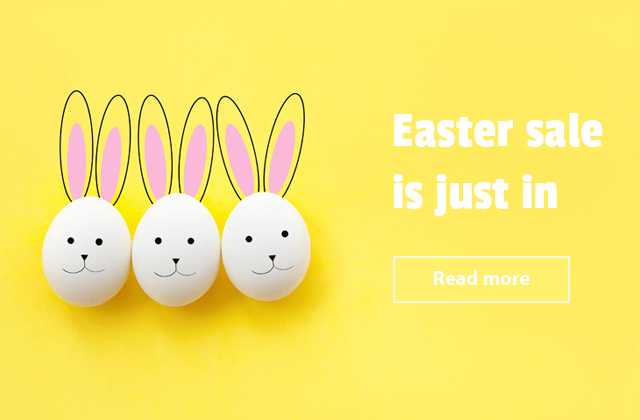 And, consequently, it reduces the time the server requires to connect with the browser. That also allows the returning visitors to reuse the cache files that have been stored in the browser to reduce the number of files they need to download. The rel="dns-prefetch" is used in the head of an HTML document. DNS prefetching basically gives you a control over how your web page loads. It looks like a hint to the browser how to look up the IP address for a domain name or URL that your customers enter in a browser. If your page resources are found on four domains, then you will have at a minimum of 4 DNS lookups, and so on. 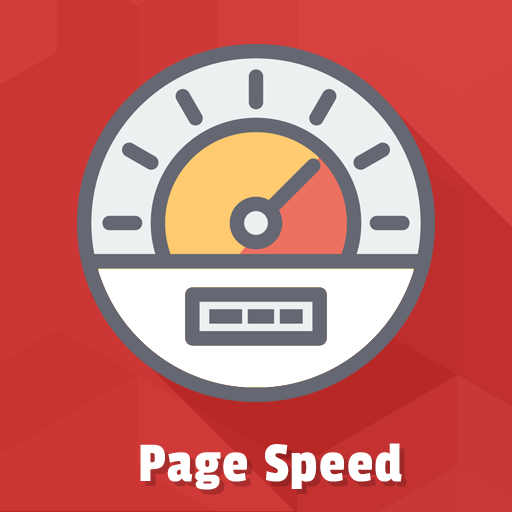 Page Speed module follows the best practice of minimizing DNS requests. It enables the "dns-prefetch" to accelerate the web pages load when they use different domains for page resources. 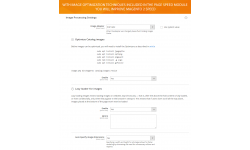 The WebP algorithm is about reducing image file size while maintaining the same quality. It offers better-optimized compression than JPG and PNG. And, WebP files have the same transparency, like PNG or GIF images. 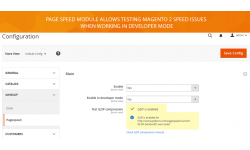 The Page Speed module supports WebP image detecting and generating in your site. As a result, you get faster load times by reduced data as well as optimized performance and improved user experience. 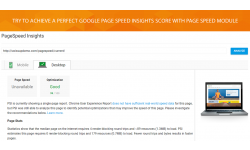 The Page Speed extension provides the advanced image processing settings that help you to generate responsive images and specify the default responsive images' sizes. Responsive support feature delivers images appropriately sized for the viewport. With the module you help the browser serve different images and load the best image size on a particular device. 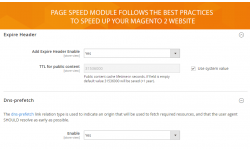 HTTP/2 push server preload is a new feature of Page Speed module. 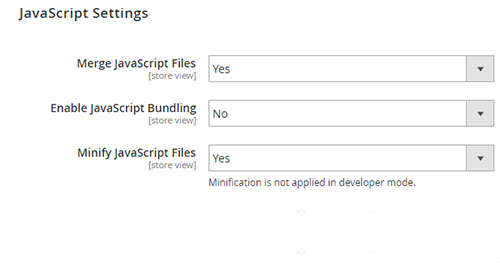 It is about sending assets to a browser without waiting for customer request. 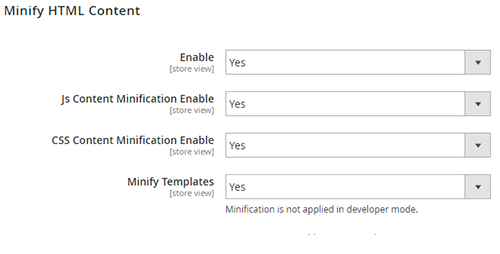 It looks like we send content in advance which the user needs for the requested page. 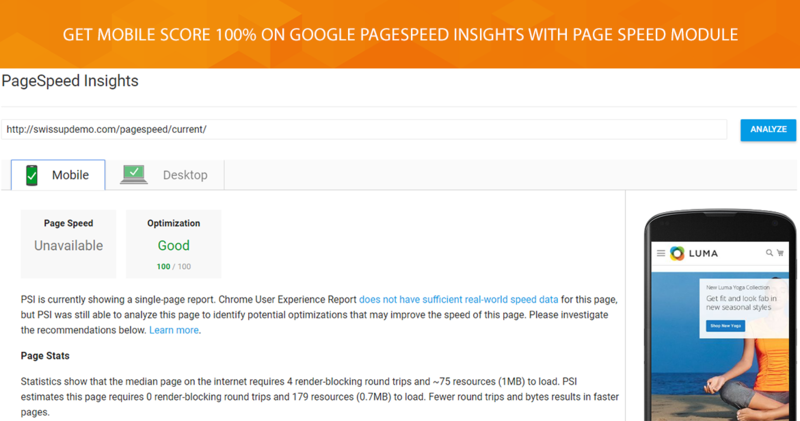 As a result, the browser starts rendering the page much faster, and your visitors get the information straight away. Now lots of websites use custom fonts, and a browser must spend some time downloading it. It makes the rendering speed of pages slower. The module has added font-display: swap property. It determines how a font file is loaded and displayed by the browser. Then it directs a browser to use the fallback font to show the text until the custom font has fully downloaded.